The nasty place where the oil would come from in Alberta, Canada. Looks like the fraught Trans Mountain Pipeline expansion isn’t happening after all. Or, actually, wait. It is—but only after the Canadian government decided to purchase the damn thing for 4.5 billion Canadian dollars (roughly $3.5 billion). Finance Minister Bill Morneau announced Tuesday in a press conference that the government is buying the 715-mile pipeline expansion and its related infrastructure outright, reports CBC. Speculation around this plan began Monday after Canada’s National Observer obtained information that original owner Kinder Morgan canceled a key permit earlier this month. Really, though, this drama but has been bubbling for weeks now. Since March, protest and opposition from indigenous nations and environmentalists has grown so severe that Kinder Morgan had set a deadline of May 31 to abandon the project if the situation wasn’t resolved. 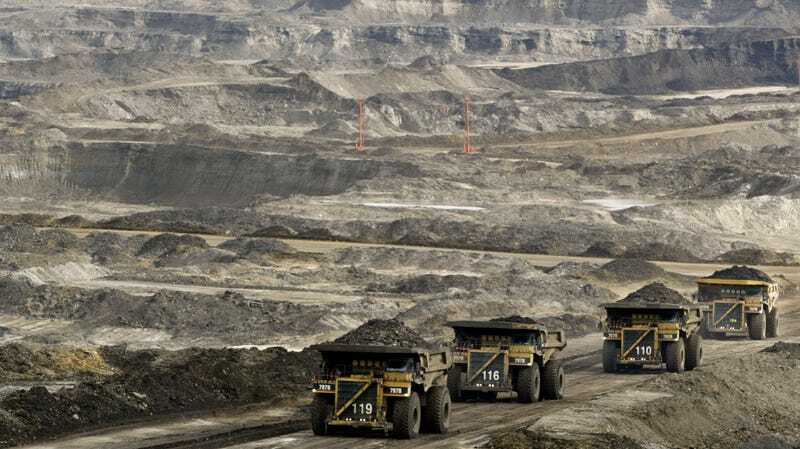 Protesters didn’t want another project that’d enable the extraction of bitumen from the Alberta tar sands or the transport of said bitumen across their lands. This fossil fuel isn’t your regular oil. It’s highly toxic and super thick, so it’s not easy to clean up. Now, a giant energy company won’t be held responsible if it spills: For now, that’s on the federal government. That’s a fact. Prime Minister Justin Trudeau—supposed fighter of climate change and champion of indigenous rights—is determined to make this crude oil pipeline a reality, calling it “vital” in a tweet Tuesday. Earlier this month, Morneau suggested the administration pay Kinder Morgan for its losses during the weeks construction was on pause. Well, that’s not happening, but it sure is paying Kinder Morgan a lovely sum to buy the Trans Mountain Pipeline. We are pleased that [Kinder Morgan Canada Limited] and the Government were able to reach agreement on a transaction that benefits the people of Canada, [Trans Mountain Pipeline system and the expansion project] shippers and both [Kinder Morgan, Inc.] and [Kinder Morgan Canada Limited] shareholders. The outcome reached represents the best opportunity to complete [Trans Mountain Pipeline system and the expansion project] and thereby realize the great economic benefits promised by that project. This isn’t the end of the story. The province of British Columbia is hell-bent on keeping the project out of its territory. So are First Nations. Lawsuits are ongoing, and it’s unclear how the federal government will begin construction this summer in light of the pending court actions. What is clear is that those on the opposition won’t sit idly by.